Despite the growing popularity of craft beers, you don't have to look far to see how the macros continue their efforts to program people into accepting lousy beer. The evidence is everywhere...on TV, on store shelves, on billboards. The principle is pretty simple. If you bombard people with enough messages associating your beer with good times, you won't have to worry about making decent beer. Anheuser-Busch (InBev) and MillerCoors have been taking this philosophy to the bank for years, and are official proof that this strategy is alive and well. So it really shouldn't surprise anyone that the reach of the beer conglomerates extends to the airlines. If you want to drink a decent beer while you're in the air, you'll probably have to smuggle it aboard. Terrorist. First, let me say that I've warmed up to Southwest Airlines. I've gotten used to the cattle call otherwise known as boarding. I actually like the no frills aspects of the airline. They are obviously one of the more efficient air carriers out there. I have nothing against them...well, almost nothing. A flight to the Bay Area for Thanksgiving gave me a chance to see the current drink offerings on Southwest. 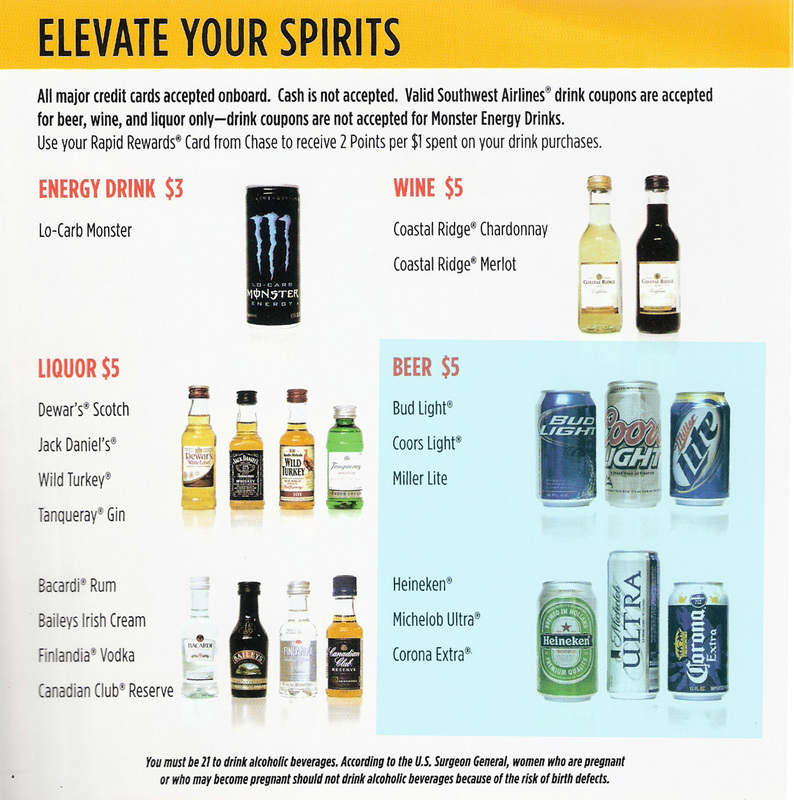 That's the booze portion of the in-flight menu you see above. Not a pretty sight. Five bucks for a Bud Light, Coors Light, Miller Lite, Michelob Ultra, Corona or Heineken! Yikes! Standards are obviously pretty low here. To me this is just another barrier that needs to be broken down. 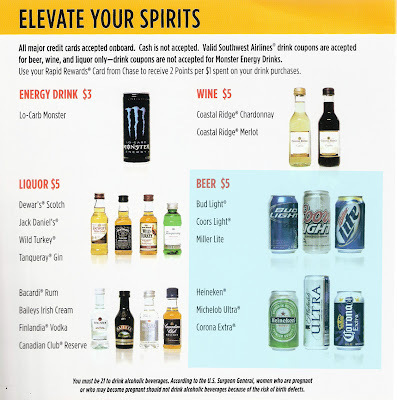 There's no excuse for any airline to be offering such a shameful list of beers. I'm not suggesting that Southwest should be pouring Pliny the Elder, but it seems to me they could offer a decent pale ale and maybe even something a little darker. A couple of craft choices would be cool. You hate to assume anything, but my guess is Southwest and other airlines offer what they do because that's what big beer wants them to offer as part of programming. I mean, how can you possibly fly anywhere without the chance to bolster your experience by consuming a tasty Bud Light? Mission impossible. Frontier Airlines offers cans of Fat Tire. A step in the right direction. Kudos to Frontier! I flew them Portland to Denver last spring and enjoyed the flight...although I don't recall the beer list. Horizon used to treat passengers to complementary pours of Northwest craft beers. Flight attendants would fill small cups from bombers and even give refills. I'm not sure if that's still going on. I believe Hawaiian Airlines offers some Kona beers...for a price. Clearly, the airlines need to get on board with craft beer movement. Southwest is an all too prevalent example, I fear.